The Sierra Grande is a brand new three bedroom air-conditioned apartment located on the 9th floor of Sierra Grand in Broadbeach! The master bedroom is very spacious & has a king size bed with built in robes, flat screen t.v, ensuite with spa bath & access to the large balcony. In the second room there are two king single beds which can be joined together to make a king bed, a flat screen t.v, built in robes & doors that open back to the balcony looking out towards the ocean & the skyline of Broadbeach. The third bedroom has a double fold out sofa lounge. There is ducted air-conditioning throughout this lovely apartment & plenty of room to accommodate up to six people. 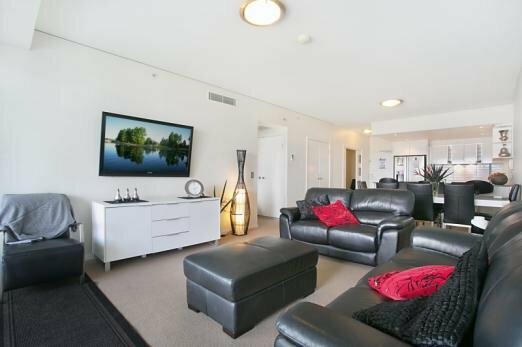 The lounge/dining room have views out towards the patrolled beaches & the balcony is the perfect place to relax after a day at Pacific Fair Shopping Centre which is located across the road. In the kitchen there is a large fridge with an icemaker. Also features a microwave, oven & dishwasher, fully self contained for those not wanting to venture out for a meal. The laundry is separate & has a washing machine & clothes dryer. In the lounge area there is another large flat screen t.v & bi-fold doors that open up to the balcony, Security parking provided for 1 car.